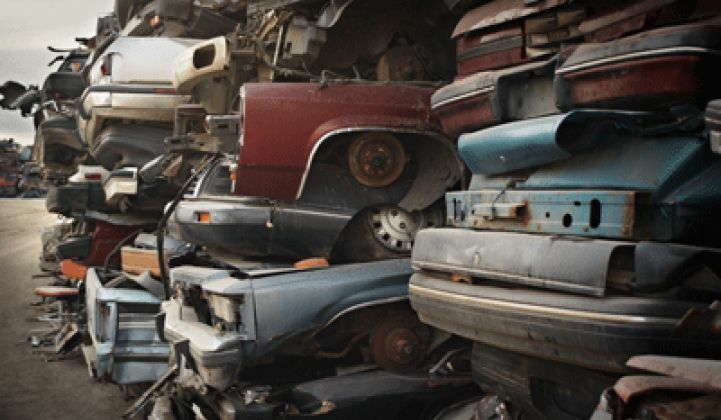 Did America Reach ‘Peak Car’ in 2005? It's not surprising that Americans started driving less after the 2008 recession. But interestingly, the downward trend in vehicle use has continued five years later. This has raised a lot of discussion about whether North America has reached "peak car." 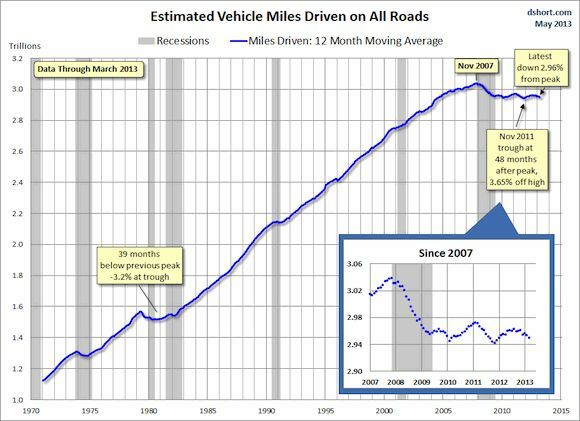 In his most recent analysis on driving trends in America using data through March of this year, Doug Short, an analyst with Advisor Perspectives, has published this graph showing a peak in vehicle miles traveled in November of 2007. That's a pretty compelling trend. But when adjusted for population growth, the downward spiral becomes even more clear. 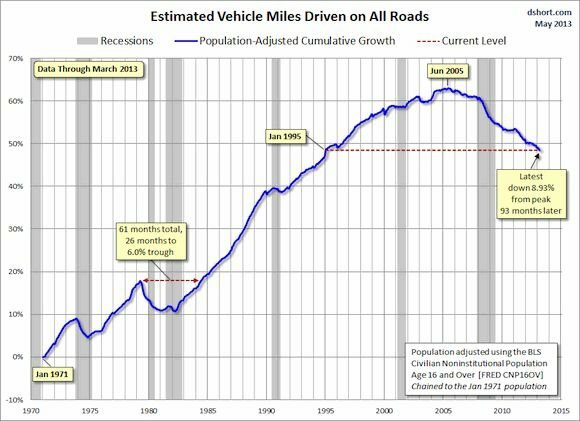 The chart below shows that Americans are traveling the same number of miles they did in 1995 -- meaning vehicle miles have fallen by 8.75 percent since the summer of 2005. That's a 93-month drop that hasn't slowed. Brad Plumer at the Wonkblog wrote a piece on the trend in April, pointing to a confluence of factors contributing to the decline. The recession, stricter licensing policies, the rising cost of auto insurance and the movement of younger Americans to cities are all major reasons for the shift in driving behavior. Another, which is perhaps the most important from an efficiency perspective, is the use of the web and smart phones to optimize public transportation, hook people up with peer-to-peer car sharing programs, and make renting bicycles easier. So does this actually mean the U.S. has hit a true peak? In a recent report on the landscape for automobiles, the Frontier Group looked at the economic, cultural and technological shifts that are changing the driving habits of Americans. The authors concluded that the peak had in fact occurred. "The unique combination of conditions that fueled the Driving Boom -- from cheap gas prices to the rapid expansion of the workforce during the Baby Boom generation -- no longer exists. Meanwhile, a new generation -- the Millennials -- is demanding a new American Dream less dependent on driving," concluded the authors. "The Driving Boom....is over."